Are you ready for a John Deere? This is an American classic. From the instantly recognized green and yellow colors, to the logo of the leaping deer, this brand is well known and respected almost everywhere in the world. This type of recognition has been earned over the years by providing an outstanding product that lasts and lasts. John Deere lawn tractors are no exception, with models and prices designed to fit most budgets and needs. 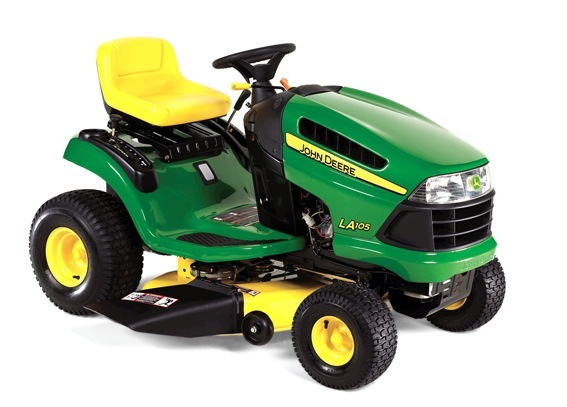 No lawn tractor manufacture offers a greater array of attachments, and no lawn tractor is more durable than John Deere. Folks, you have to be impressed with this line of lawn tractors. Simply put, no one delivers more than John Deere. The company is so confident in their product, their website allows easy comparison with all the major competing brands you might also be interested in. All the John Deere lawn tractors feature a multitude of options and accessories, to include mulching and rear bagging. The deck cutting height is adjusted manually using a lever, a foot assisted lever, or a powered hydraulic device. The front axles on all John Deere lawn tractors is fabricated of cast iron (would you expect anything less?). Cast iron is the sturdiest material available for a lawn tractor front axle. The deck design on all John Deere lawn tractors feature the ‘step through’ design. This eliminates any obstructions in front of the drivers seat. This allows for easy entry and exit from the tractor without the need to lift feet and legs over a raised portion of the frame. John Deere lawn tractors are available in four model series - the 100; 300; 500, and 700. The 100 models are considered the lower end in price and features ( but still come nicely equipped), and are followed by the 300, 500 and 700 series in cost and available engine power. There are eight 100 models available, six models in the 300 series, four models of the 500 series, and 12 models in the 700 series. The 100 series offers a choice between a single cylinder Briggs and Stratton overhead valve ( OHV) single cylinder 19.5 or 21 HP engine ( models LA105, LA115, LA125); a Briggs and Stratton twin cylinder over head valve engine, rated at 22 HP (models LA135, LA145, LA155); or 26 HP Briggs and Stratton twin cylinder (model LA175). All the 100 series models have a manual PTO used to engage the cutting blades for models LA105 through LA135 ( 42” cutting deck). The models starting with the LA145 and higher all feature an electric PTO ( 48 “ cutting deck). On all the tractors in the 100 series (except the LA105), there is a 2 pedal foot control transmission. Count on spending between $1500.00 to $2800.00 for the tractors in the 100 series. Next in line is the 300 series John Deere lawn tractor. You will notice additional features, including 17, 22, or 25 HP Kawasaki twin cylinder overhead valve 4 stroke engine. All versions of the Kawasaki engine have a pressurized lubrication system with an oil filter, similar to your car engine. The transmission is a heavy duty hydrostatic, with twin touch pedal controls. Cruise control is standard. The cutting deck will vary depending upon the model, from 38”, 42”, 48”, to a whopping 54” ( available on model X340). In all cases, the PTO is electric. The cutting height is determined by a foot pedal, with adjustable spring assist. Contrast this with most riding tractors that use a manual lever to set the deck cutting height. The deck is also equipped with rotating wheels on the outside of the deck that provide support as it is being removed or installed on the tractor. As with all of the John Deere lawn tractors, options and accessories are plentiful, including 14 tow behind tools. . This type of luxury and performance does not come cheap. The 300 series will cost about $4000.00 to $5100.00. The 500 series is a machine to behold. These beauties are powered by either a 25 or 26 HP Kawasaki twin cylinder overhead valve 4 stroke engine with a pressurized oil system and spin on oil filter ( the 26 HP engine is water cooled). The transmission is fully automatic, with differential rear lock wheels. Cruise control is again standard, as is full power steering. The cutting deck will vary depending upon the model, from 48”, to a the generous 54”. The PTO is electric. The cutting height is determined by a foot pedal, with adjustable spring assist (model X500 and X520) or is controlled by a power hydraulic cylinder (model X534 and X540). The deck is equipped with the rotating deck wheels that provide support as it is being removed or installed on the tractor. The price range of this sweet machine is $5600.00 to $6500.00. Now for the 700 series , the ultimate residential machine offered by John Deere. If this series doesn’t put a smile on your face, then you don’t have a pulse. These masterpieces are powered by a 23 or 27 HP Kawasaki twin cylinder overhead valve water cooled 4 stroke engine with a pressurized oil system and spin on oil filter. The 27 HP version has electronic fuel injection, so say goodbye to carburetor problems. The models X740, X744, X748, and X749 contain a Yanmar 3 cylinder diesel engine, which produces 24 HP.The transmission has the twin touch pedal design, with optional four wheel drive. Differential lock is again standard, as is power steering. The cutting deck will vary depending upon the model, from 48”, 54”, to 60”. The PTO is electric, and the deck is lifted using a powered hydraulic system. An intriguing feature is the four hydraulic outlets that can be used to power an impressive variety of attachments. There are 19 tow behind tools available. The cost of John Deere 700 series nirvana? A mere $8,000.00 to $12,000.00. John Deere customers seem to be loyal for a lifetime, and it is easy to see why. If your budget can afford a John Deere, buy one. Likely, you will not regret your decision.